1/2 cup sugar 1/4 cup butter (1 stick) 2 Tablespoons water 1/2 teaspoon vanilla 1/2 cup nuts (optional) 1/2 cup chocolate (optional) In choosing nuts, any nut that you enjoy will work. I usually use toasted hazenuts or almonds. (If you have raw nuts, see my tutorial on how to roast hazelnuts). You can also experiment with other flavors such as tamari smoked almonds; the mix of sweet and smoky flavors is addicting! If you want to add a layer of chocolate (totally optional) any chocolate that you enjoy will work. I personally prefer a semi-sweet dark chocolate against the sweet toffee, and semi-sweet chocolate chips are very easy to work with. Or if you feel like splurging, get some good Scharffen Berger or other high-end chocolate. Since the chocolate is only just heated to melting, it's worth it. 1. Heavily butter a small cake pan, such as a 9" round or square pan. (I use butter and a nonstick pan for extra ease). Set the pan aside on a heat-resistant surface such as a trivet or folded towels. 2. Chop the nuts and put in a small bowl for easy pouring. Set aside. 3. If using chocolate that is in large pieces (i.e. not chips), chop it into smaller pieces and set aside. 4. 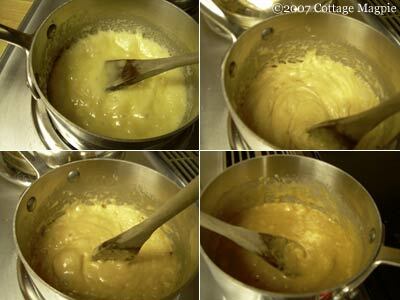 In a small but heavy gauge sauce pan place the sugar, butter, water and vanilla. 5. Heat on high, stirring constantly (and I do mean constantly). 6. Watch the toffee transform. It will start by turning golden and bubbly, then get thick, then a few minutes later will start to turn brown. When it turns toffee colored, it's done. Technically it's done at the hard crack stage, or when it hits 300 degrees. But it invariably turns the right color of brown at exactly the right moment, so you don't have to measure or do cold water tests. Isn't that cool? 7. Still stirring, take the pan from the heat. Dump in the nuts and stir in. 8. Pour into buttered pan and press until flattish and spread-outish. 9. If using chocolate, sprinkle the chocolate over the toffee and wait a few minutes for it to melt, then spread it out into a thin layer using a spoon or spatula. 10. 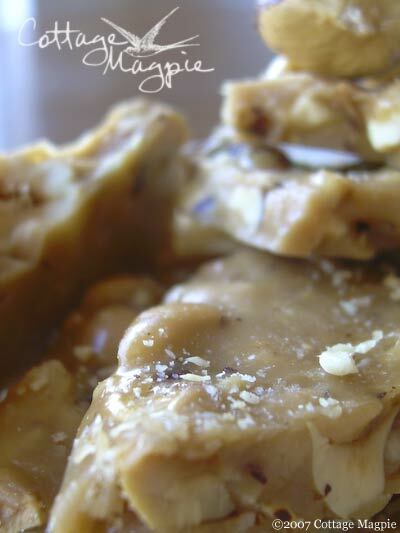 Wait for the toffee to cool, then break into bite sized peices and enjoy! To clean up, just wait for the pan and all the utensils to cool completely, then let them soak in cool water. 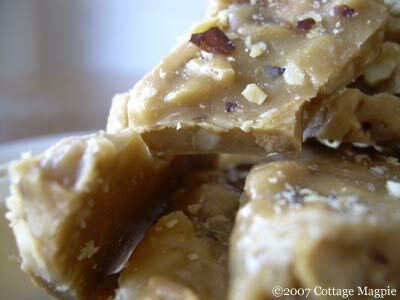 The rest of the toffee will rinse right out. NOTE: DO NOT LICK THE SPOON or any other utensils. You will burn yourself! Also, DO NOT put the candy pan directly into water. The rapid cooling effect could cause spattering candy.